This set of four Padilla Stoneware Hand to Hand mugs is just one of Padilla's unique designs. This particular Padilla design now comes in 9 different colors. Notice the stoneware cup design with the grove pattern on the mug. 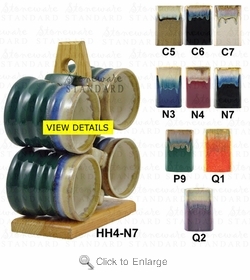 This Padilla Mug Tree Set would make a great addition to anyone's kitchen decor. 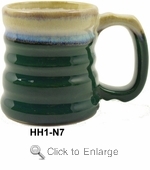 You may order replacement mugs for this set here Padilla Stoneware Hand To Hand Mug. Understand replacement Mugs may vary in color from original mug set.